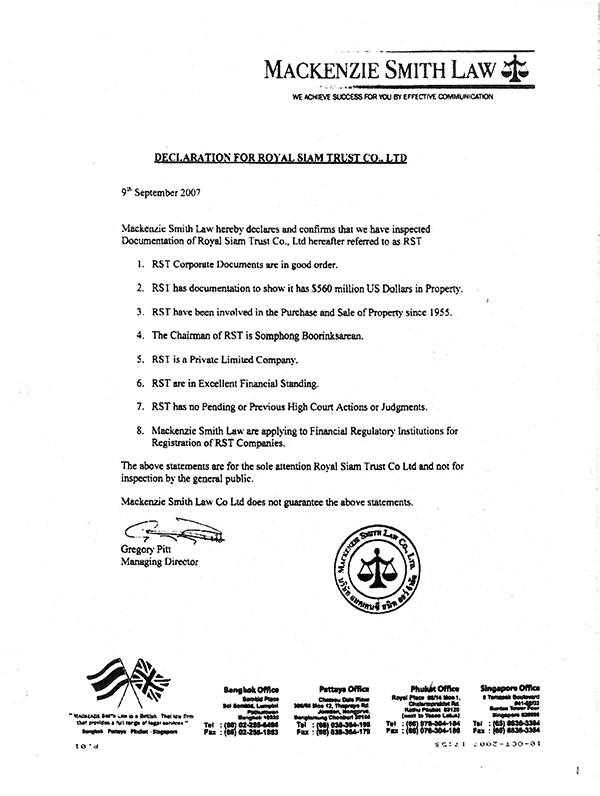 In this Declaration it is made clear that Gregory Pitt of White Sands Beach also controls the law firm that was advising White Sands Beach, Mackenzie Smith. An extreme conflict of interest that destroys the legitimacy of the statements in the Declaration. REMEMBER: GREG PITT GAVE US A LEGAL OPINION (ALTHOUGH HE IS NOT A LAWYER) ON WHITE SANDS BEACH AND ALSO CONTROLLED OUR INVESTMENT IN WHITE SANDS BEACH. WE HAVE LEARNED T HAT NONE OF THE STATEMENTS IN THIS DECLARATION ARE TRUE. THEY ARE ALL FALSE. WE RELIED ON THE LEGAL OPINIONS FROM MCKENZIE SMITH IN MAKING OUR DECISION TO INVEST IN WHITE SANDS BEACH. WHO IS MCKENZIE SMITH? GREG PITT I S MCKENZIE SMITH.